This blog is created by Ranjan Ratnakar Kelkar, former Director General of the India Meteorological Department, New Delhi (1998-2003). After his retirement from IMD, he had served as ISRO Chair Professor at the Department of Atmospheric and Space Sciences of the University of Pune (2004-2008). Prof. R. R. Kelkar has earlier been the President of the Indian Meteorological Society (1997-99) and he was an elected member of the Executive Council of the World Meteorological Organization, Geneva (1999-2003). He has over 50 research publications to his credit and is a recipient of the IJMG Award and the J. Das Gupta Award. Prof. Kelkar is the author of five books: Satellite Meteorology, Monsoon Prediction, Climate Change – A Holistic View, Bible Meteorology and Satellite Meteorology (Second Edition). He has also written three books in Marathi: चिंतन ३६५ दिवसांसाठी, संवाद देवापुत्राबरोबर and महाराष्ट्राचे हवामान. He was born on 19 December 1943 at Mumbai and received his B. Sc., M. Sc., and Ph. D. degrees in Physics from the University of Pune. 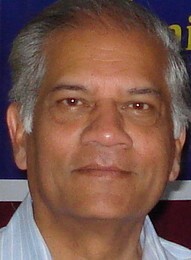 He resides in Pune and is a freelance writer and speaker on matters related to meteorology and spirituality. Praise the lord sir god bless u..i would like to order books SANWAD DEV PUTRASHI.how i can get these 📚.and very happy to read your Marathi articals.and really it will help people to know true living and loving god..
You may also like to visit my Marathi web site https://ranjankelkar.wordpress.com which has a lot of material that may interest you. Dear sir .regards i would like to order sanwad dev putrashi copies . Please get in touch with the publishers WhiteLight Publications, Pune. Their contact no. is (020)24450424. I want statewise data of annual humidity, rainfall, max. temperature, min temperature of india from 2000-2014. Will you please help to get the mentioned data. Thanks for your mail. Since you are in Pune, you may visit the National Data Centre at IMD, Shivajinagar, Pune and discuss your requirements. greatest blog i have ever seen, sir…. My email id is correct kelkar_rr@yahoo.com and you may send me an email. Please check your mail. We have sent all the details you asked for. Thank you once again for your kind invitation, but I am sorry that I am not able to accept it because of prior commitments. I am undergraduate from VIT UNIVERSITY Vellore. I sent you invitation through email on the above given mail id to give lecture in our tech fest Gravitas this September. Please go through the mail and reply. We will be grateful to have you as our guest. Sorry, but I did not get your mail. I have sent a reply to your mail. It seems difficult. But I have asked you for more information on the fest. I HAVE JUST READ YOUR ARTICLE IN AGROWON ISSUE ON 20.4.2015. I FOUND IT VERY INFORMATIVE. MOREVER, IT IS EASY TO UNDERSTAND. I HAVE TRIED TO EXPLAIN THESE THINGS TO MY STUDENTS AND MANY RESEARCHERS, AS WELL AS, THE FOLK AND FRIENDS, (PARTICULARLY, WHEN THEY IGNORANTLY MAKE A FUN OF THE WEATHER FORECAST.) I WILL NOW RECOMMEND THEM TO READ YOUR ARTICLE. R/S, I AM WORKING (VERY PASSIVELY) ON THE ISSUE OF EFFECTS OF CLIMATE CHANGE IN ANIMALS, PARTICULARLY FROM PHYSIOLOGICAL PERSPECTIVE. I NEED TO DO MORE WORK IN MORE APPLIED MANNER TO DEVELOP AN ADVISORY FOR ANIMAL OWNERS, SO AS TO GIVE THEM AS MUCH SIMPLE TIPS AS POSSIBLE FOR MAKING MODFICATIONS IN THE MANAGEMENT ACCORDING TO THE CHANGES IN WEATHER CONDITIONS, TOWARDS MITIGATION, SO AS THO AVOID THE LOSSES DUE TO ADAPTATIONAL STRESS. I HOPE YOU WILL GUIDE ME AS AND WHEN I REQUEST FOR THE SAME. EVEN YOUR SIMPLE CONTACT WILL INSPIRE ME MORE. Thanks for your comment. Maybe when you come to Pune we could meet and discuss. Yes sir thank you but i don’t know properly how much they will charge for the data…? I have taken Karnataka as the study area…. I am doing M.tech. Sir i have taken up “assessment of suitable sites for Solar & Wind Energy” project in my 4th sem… I checked in Meteorological centre,banglore for Solar & Wind Energy Data sir…. They told I will get only Wind Energy data there so for Solar Energy Data pls suggest me some source sir…Sir I checked in IMD,pune web site… Sir for students also will they charge for the data..? Ask for solar radiation data or sunshine data. You can convert it to solar energy. sir,i am niharika,doing my mtech water resources engineering in NITwarangal……as a part of my academics,i have to give presentation on a topic..can u please suggest me some more seminar topics…. You can speak about northeast monsoon. I am a post graduate research student in Tamil Nadu. Sir, I need daily temperature and rainfall data of all district of Tamil nacu form 1st October-2013 to 30th June-2014. Is their any specific source available for this? Yes, the best source is IMD. Thank you very much for replying Sir. I tried but I couldn’t find it!! Is there any specific link available Sir? Thank you very much for providing such a nice source of information. I am doing Biological Research and this data will help me to correlate the things with respect to temperature and Precipitation. You may contact the Regional Meteorological Centre, Chennai, and take their help. You have not mentioned the place for which you want the data. Is it Chennai? Also which 12 months? The preceding year or some older year? You could also contact the Regional Meteorological Centre in Chennai and take their help. i have this IMD data where the month is split into 2 “I and II” for both rainfall and wind pattern. dont know why there is split. i am not able to past the image. Can you tell me where exactly you have seen this? In a publication? Or in a downloaded form? I guess “I” and “II” represent observations made at 0830 and 1730 hrs IST respectively. But I can be sure after you send me some details. Where are you working, Sushant? We are going to publish a magazine on Baboo Radhanath Sikder in our magazine in Bengali to tribute him. Our magazine’s name is ‘Bhugol O Poribesh’ (Geography And Environment) with help of ‘Purbasa Eco-Helpline Society’, a Sunderban Based NGO. We all know that you are already worked on him. So, sir kindly if you send any writings or any wishing letter for our this special issue, we will grateful to you. Thank you for your kind invitation, but it seems that yours is a Bengali magazine and I cannot write in Bengali. I can only give my best wishes for the success of your efforts! I am Divya Prakash, Research Scholar at Centre of Excellence in Climatology, Birla Institute of Technology, Mesra. Sir, I would be grateful to know the method for calculating the normal rainfall. This question came in my mind because I noticed that in case of East Rajasthan, the normal rainfall during Monsoon 2009 was 623.6 mm while actual rainfall was 430.1 mm with deficient of 31% (http://www.imd.gov.in/section/hydro/dynamic/rfmaps/seasonal/mon2009.jpg). But in case of 2010, the normal rainfall of East Rajasthan increases to 630.3 mm (http://www.imd.gov.in/section/hydro/dynamic/rfmaps/seasonal/mon2010.jpg). When rainfall was excess during Monsoon 2010 after that the normal rainfall for Monsoon 2011 decreased to 615.8 mm. During 2009 the rainfall was deficit then I am not understanding why the normal rainfall increased in 2010. Ladakh is an area of low rainfall and, therefore, flash floods caused by intense rain are rare events. In fact, the August 2010 flash floods came as a surprise to many. Because there have hardly been any past (documented) events of this nature, it is very difficult to generalise the causes in terms of amount or intensity of rain, as you wish to do. Flash floods do occur more frequently in Himachal and Uttarakhand, usually due to cloudburst. I suggest that you get in touch with research institutions in these states and draw parallels from their studies. If you go to Google Scholar you may find relevant research papers. You may also like to refer to the work done by ICIMOD in Nepal. Predicting rare events is always tough. More so in the case of cloudburst over Ladakh, which may not happen hopefully for many more years! Would you care to tell me where you are based or with what institution you are working? Also, which rivers you are interested in? my self kyada pradip. i am doing M.tech. in SWCE. My Question is how to find out the Vapour pressure from dry and wet bulb temperature,? otherwise from where i can get the relationship between dry and wet bulb temp and vapour pressure….?? i am waiting for your reply…. You will find the answer in any elementary textbook on meteorology. Have you asked IMD? If not, please do so. I mailed G. Krishnakkumar. long back.. but did not get any reply. Where in IMD can i enquire about it. i wants to know how can i find the drought year in dehradun ?please tell me the latest drought year of Dehradun city. I suggest that you contact the Director of the Meteorological Centre, Dehra Dun. I am Abira Dutta Roy, a research scholar from Jawaharlal Nehru University, New Delhi.I am working on a hydrological model called SWAT. In the model with the help of climatic parameters such as maximum minimum temperature, rainfall, relative humidity, solar radiation and wind speed together with land use, soil, ground water data I can simulate runoff. The model runs on daily time step. I wanted to compute normal daily temperature, normal daily wind speed, daily normal rainfall etc. and look into how with normal weather conditions and changing land use land cover conditions the runoff changes.calculating daily normal temperature , solar radiation, wind speed etc was not a problem as they are simple averages. I am facing problem in computing daily normal precipitation. If I compute a simple average, everyday is experiencing a certain amount of rainfall, which is not the case in reality. To capture the real situation i thought of estimating the probability of occurrence of rainfall in a particular day . But that too i dont feel is the right way of calculating it. First of all, you should discuss such problems with your guide and I hope you have one. If you don’t have a guide you will be in serious trouble. These days it is easy for anyone to download any model and to run it anywhere without understanding it. This is just “garbage in garbage out”. Secondly, SWAT is basically a hydrological model that predicts runoff in a watershed or river basin, given the weather parameters. You have not told me on which region you are working so I have no idea of the likely precipitation. Then, you seem to be using the model in the sense opposite to its purpose. You are trying to estimate precipitation from the runoff, if I understand you properly. Further, you are trying to get annual normals from a model that has a 24-hour time step. How is that possible? Since you are working in JNU and apparently you are not getting much guidance there, I suggest that you read papers about the applications of SWAT, its limitations and potential use, and some case studies for India. Maybe you have to visit a library for that purpose. Google search is not the solution for every problem. If you continue to work in the way you are doing now, I am afraid you will get absurd results. Thank you for all of the support you gave us to complete our project successfully. You can visit our international website by following the link below. Please feel free to share your views on the website in the “Public Portal” page. You will find that in the “More” menu. First of all let me congratulate you, your fellow students and your teacher for designing an excellent web site on the rain and monsoon of India. It has excellent content but what really impressed me was its professional look. I have written a post about your web site in this blog. I have interacted with you earlier regarding the latest updated version of Indian Climatological tables book. As per your advice i have contacted the Mausam Bhawan(Library section) and they say that the latest copy available with them is of data from 1951-1980, the same copy is available in our library too and also i was apprised of a new book being published with data of weather from 1961-1990. Sir, your previous blog suggested an updated version of weather data available upto the year 2000.Sir, Kindly let me know if any such hard copy exists as the latest data would help us a lot in our projects. If you click on the link http://www.imd.gov.in/doc/climateimp.pdf you will be able to see a pdf file of “Monthly mean maximum & minimum temperature and total rainfall based upon 1901-2000” for 122 stations in India. If you want month by month (not mean) data you can click on http://www.imd.gov.in/section/nhac/mean/110_new.htm. You can then take prints yourself. Thanks, Pooja, for visiting my blog and leaving a comment. I am proud to be student of teacher like you who despite having achieved that not many can , helps people through blogs . In one of the latest update in your blog , you have mention the image of meteorologist in the common public. But I think we are not doing enough to improve that . Latest example of cyclone Phyan . Do you think the track prediction was upto the mark . Did not we did abysmally bad ? I will be happy to see your comment on it . It was nice to hear from you. Hope you are doing well. What you say is very pertinent, but as a rule I do not get involved in operational matters which are IMD’s responsibility and best left to them. Very glad to just see this site. and fullof joy after reading about you. I am a practicing architect from Pune for past 15 years. Currently I am perusing my masters degree in Environmental Architecture. As a part of the study for this course, I was browsing through various pages related to climate. I also had particular requirement of climatic data of Shreevardhan in Konkan where i am proposing a project as a part of the course study. While surfing on the net, i came across your blog. I was amazed to see your enthusiasm in starting the blog and also to see the replies sent by you to various queries with great patience! Thanks for your nice comment. There are many people who visit my blog as I can see from the hit counter. But there are only a few like you who actually spend time and effort to express themselves on my blog. I appreciate your kind gesture. sir, i need climatological data for jaipur which includes sun path diagram,altitude, azimuth calculations,wind rose diagram etc. pl. guide . thanks n ragards. If you are located in Jaipur, please contact the Meteorological Centre there. Or, please visit the web site of the India Meteorological Department Pune at http://www.imdpune.gov.in/research/ndc/ndc_index.html where you will find information on available data and how to acquire it. Rakesh from Nagercoil, near Kanyakumari. Following your blog regularly for past 6 months. I’m a weather enthusiast, and running a web blog purely for India weather reports and forecasts. We (me and my father) follow & Discuss weather changes and really enjoy it!. Now i’m trying to develop a “Online Weather Community” for India. Please help me with your advises. I have visited your site off and on. It is nice, but you take a lot of information from other sites and you do not always give due acknowledgement. If you want to develop an online weather community, you should not copy everything into your site, but describe what information other sites have and provide links to them. I came across your blog when I was looking for latest version of Marathi bible that I wanted to buy. Since I left our high school (St. John’s Secondary School, Pune), I lost contact with old shoolmates. I read your articles and they are very good, especially the one on Kalidasa. On my recent visit to Pune, I met Ramlal Khandale and Shankar Belgude and they told me about you. Reply to me when you will get time. I live in Staten Island, New York. What a pleasure to rediscover each other through this blog! Let us now remain in touch. I am travelling next week and I shall send you a longer mail after I am back. I really enjoyed browsing through your pages. Your blog is such a treasure trove of information on Indian meteorology. I would appreciate if you can devote some time and energy on meteorological education and training in India, and find a way to inspire bright young students to pursue careers in meteorology, both in operations and research. I am happy to know that you are planning to write a book on climate change with focus on India. Please do not hesitate to contact me if you need any help in your efforts. How nice of you to write your words of appreciation about me and my blog. It is indeed a popular blog and in the last two years there have been over 37,000 hits. Two of my books on Satellite Meteorology and Monsoon Prediction have been selling well and that has encouraged me to take up writing this book on climate change. My idea is to present a balanced view of climate change and not a one-sided scary scenario as is often done. I have your paper on the PRECIS simulation but if you have any updates I would be happy to have them. I used to teach at the University of Pune until Dec 2008 when I retired after crossing 65 years. Thank you for your response, I look forward to hearing from you when you get back from traveling. where you can find global maps of sunshine for each of the twelve months. I do not know how accurate the data is, but it may suffice for your anthropological research. Do tell me if you find the information useful. I am writing an anthropology paper about how geography influences culture, in this case, the culture of the people of the Deccan Plateau in India. I am focusing on the use of solar power. I saw a figure (and lost the specific URL) on the internet saying that they have a high percentage of sunny days enabling them to benefit from solar sources. I can’t locate this information on percentage of sunshine per year, can you help me? I could benefit from this information in a smaller area, I could limit it to a city i.e. Bangalore. Thanks for your comment. I am on travel right now but I hope to give you some information next week. Is that OK? My email id is kelkar_rr@yahoo.com. I am very suprised when I see your blog. It is a very interesting,impressional and useful blog. It shows so many informations about weather and climate. It brings many knowledges to me who intered in meteorology and remote sensing. I am happy to know that you have found my blog interesting. Please visit my post ‘Archive of Kalpana-1 Satellite Images’ on this blog. You will find there some help on how to get past satellite images. Hopefully you will get what you want. But if a you have a problem please tell me. May be I can do something. I have been visiting your blog regularly and would like to thank you for all the enlightening postings. I am a film student/film maker from Satyajit Ray Film and Television Institute, kolkata. In few weeks from now, I will be shooting my thesis film. The film is driven by the protagonist’s passion for rain … and her accidental meeting with a woman farmer who helps widen her world view. For the film, I need weather satellite maps/ weather maps which indicate dense cloud over kerala to indicate the onset of monsoon. It means that I need archival material/ images of 25th May onwards. Where can I find them? Any suggestions? (www.weather.nic.does not have a archive). Does IMD give archival materials/images to be used only for academic purpose? I am very eager to send a copy of the film when I finish it. It has a song being written and composed on Rain! I want to know about the History of Monsoon Trough. I am S A in RS/RW Jodhpur and presently doing Ph.D. on Palaeoclimatic conditions in parts of Thar Desert. Is it Upper Eocene age, or Miocene ? I will be highly obliged if you can send me such material of Past Climatic Changes from Quaternary to Recent. H S Sisodia, S A, IMD, JODHPUR. Thank you so much for your nice comments. Kindly see my reply to your other comment on the Simla Office post. The write up is beautiful never knew that Simla office existed in Pune. Pray accept my congratulations on the article. However you did mention that Kennedy house is no longer there. I beg to differ . I did my schooling and college education from Simla before completing engg from IIT Madras in 67. In our time while going to school ( Har Court Butler ) we had to pass the Kennedy House building which housed the labour commission branch . Next to this building Kennedy cottage was built during the war to house Insurance Dept Minsitry of Finance . My father retired from that office in 1975 as Deputy Controller of Insurance. The Kennedy House was located on the Mall road near to the main road to Ananadale groaund down below – a motorable road that could take in Army 3 tonner trucks. I still distinctly remember the building . I hope you were referring to the same building. 2-B, 6-3-1100/4, somajiguda , Hyderabad-500082. I browsed through your blog on Cloud and Sunshine for about an hour. Your postings were very interesting. It is so amazing and inspiring to read your thoughts on topics ranging from Science to Philosophy of Weather, and the way you have been so constructively utilizing your time after superannuation. I enjoyed reading your blog. I wish and pray, May God bless you so that you keep blessing us by your inspiring thoughts for ever. Very interesting, informative and enjoyable blog. I believe in the adage “a busy person will always have time for every thing”. I wish I emulate at least a miniscule percentage of your enthusiam and involvement. I enjoy your Blog practically every day.